Longcase clocks are tall weight driven pendulum clocks. They have evolved from lantern clocks with a case built around them, possibly to protect the pendulum and weights from interference form children or pets, or alternatively aesthetically it is more pleasing. Most longcase clocks were made from circa. 1660 to 1860, although production had ceased in London by approximately circa. 1800, but continued to be very popular elsewhere in Britain. There are two types of longcase, the 30 hour clock which is built using exactly the same mechanical idea as the lantern clock, and the 8 day clock which was a completely different design. The 30 hour clock is wound by pulling on a rope to lift the weight, these were less expensive to produce as they had fewer pieces to be made and used the well-known system of the lantern clock using a count-wheel striking system. 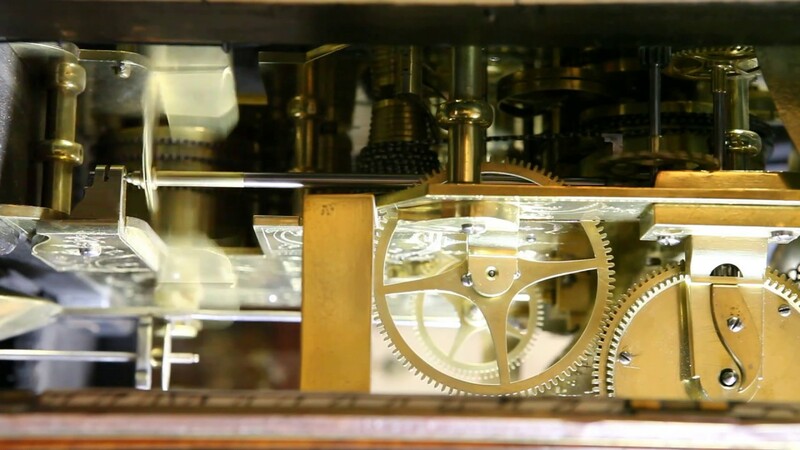 The 8 day clock is key wound through a hole in the dial, they use the rack and snail striking system that later went on to be the universal striking system in all 8 day longcase striking clocks from circa. 1700. All longcase clocks had brass dials, until the introduction of the painted dial around 1770. A variety of woods have been used from walnut veneer, common mahogany, satin wood and rosewood. Oak was often retained for the cheaper type of clock. You can estimate a date of manufacture based on certain characteristics. Around 1700 hollow mouldings under the hood replaced convex mouldings. The arch dial and arch door appeared around 1725. In 1750 the architectural columns became freestanding, where as in early longcase clocks they were originally attached to the hood doors. The original clocks had pedimented hoods which after 1680 became flat top hoods, ornamented with carved wood cherub head crestings. In the late 17th century a cushion top was more favoured until the appearance of the hollow pediment in 1730, and subsequently the swan neck or broken pediment later in the century. Some longcases are still in production today but do not have the same build quality as they used to have. Click to download our guide to setting up and regulating Pendulum Clocks. It is essential that a clock is ‘set up’ when put into operation after a move to a new position. If you would like to see all of our Longcase Clocks and more, visit our showroom.